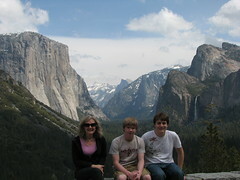 We have long wanted to go to Yosemite, but haven't taken the time to do it--until today. The crowds in the summer have kept us away, but the spring is a great time to go. There were relatively few people and the weather was great, though a little cool. We were able to see the main sights and take a small hike to a great lookout. Tonight we are back in Sacramento with Ellen.